I hope you all enjoy this fabulous project with design team member Pam Bray. This piece will be darling on display all summer long! With the celebration of the Fourth of July right around the corner, how can you not think stars!!! Today I am using a dimensional wood star I purchased at the local craft store to create my Nautical Bliss project with. Trace the star on scrap paper and cut out. Re-trace on to the pattern paper, cut out and adhere to top of wood star. Die cut cork paper and chipboard. Add journal block behind the frame. Adhere to top of star. Add sticker from the Nautical Bliss Paper Package. Roll a couple of the sticker flowers using the flower mat, stylus and tweezers. Fussy cut banner flags from Nautical Bliss paper. Add to top of star. Adhere twine to top of flags. Fussy cut like banner flags and add to top of star with pop dots. Punch out small flowers, roll with stylus using flower mat. Stamp Riley with black ink, color with markers. Stamp Riley on Nautical Bliss pattern paper. Fussy cut, adhere to Riley. Add Riley to top of prepared star. Die cut doilies from Nautical Bliss pattern paper. Adhere to paper strips and place on the sides of star. 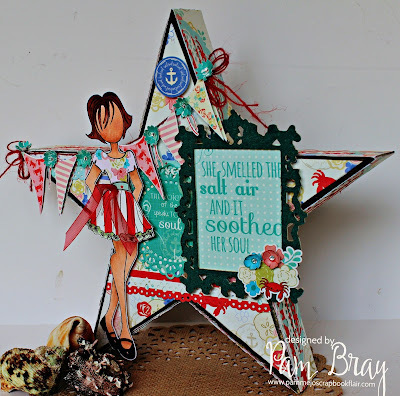 I hope I have inspired you to get your Nautical Bliss Paper Package out along with Julie Nutting's Paper Doll Stamps and create a fun Fourth of July decoration. really wonderful star decoration! Great tutorial. Thank you.